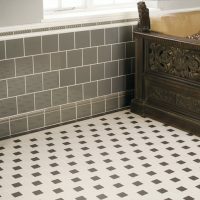 Have a browse through our wonderful selection of Victorian floor tiles. 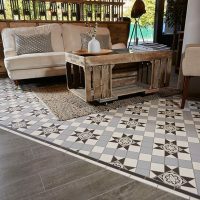 from a huge range of tiles and patterns to choose from, you can re-create and restore any space with these hard wearing, long lasting and simply beautiful floor tiles. From hand decorated tiles, to stunning borders and patterns. 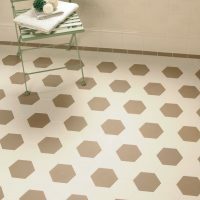 You will be amazed at the design variations and individuality that can be achieved by using these tiles in your home! There’s no better way to add character, charm, and sophistication to your home than with Victorian-style tiles. 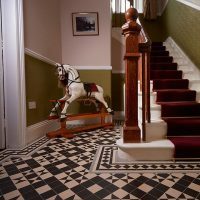 Available in a variety of traditional patterns and colours, the right Victorian tile can immediately transform the tone and style of floors — turning it into something truly remarkable. Are you considering decorating your home with Victorian-style tiles? Read on to find out the benefits of using Victorian-style tiles and the rooms they work best in. 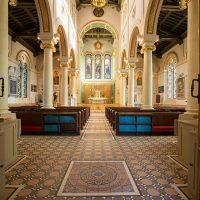 What are the benefits of using Victorian tiles in your home? Timeless — They look as good today as they did in the 1800s era. Period flooring will stand the test of time and give your home that handmade, delicate touch from the Victorian reign. Unique — Use Victorian tiles to reflect your personality and truly make home your own. This style of flooring around a fireplace can look traditional, elegant and warm. Wide choice of designs — You’re bound to find the perfect Victorian-style era tile to suit your taste. Browse our range of flooring for ideas and inspiration. Keep reading this guide for further inspiration. 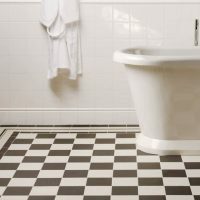 Traditional Victorian bathroom floor tiles are the way to go if you want to create a stunning impact in your bathroom. Rather than focusing on pattern, it’s easiest to begin by choosing the colour of your tiles. Black and white is always a great choice for bathrooms from that era. Not only are black and white Victorian-style tiles elegant and timeless, but they also epitomise luxury in homes — and who doesn’t want a little luxury in their bathroom? They’re extremely versatile, too. Whether you want a bathroom that’s modern, traditional, or somewhere in between, black and white tiles always look amazing. What looks good with Victorian-style tiles in the bathroom? You can choose to run with the black and white theme throughout your bathroom — or whichever colour scheme you choose! For example, you can further use black and white on the walls, light fittings, and even artwork. On the other hand, you can simply save the tiles as a neutral backdrop and decorate the rest of your bathroom as you please. They’ll look great either way! What other items best complement Victorian-style tiles in the bathroom? A mirror is an essential in every bathroom and the right one can really work in conjunction with your Victorian tiles. A large antique or wrought-iron mirror hung over the bathroom sink will complement Victorian tiles nicely and pull the room together. Of course, no Victorian-style bathroom is complete without a classic free-standing claw-foot bath tub. These days you can source a claw-foot tubs in modern designs and colours. They will add a fresh look and feel to your bathroom while still retaining that sense of old world charm. You can even go all out and opt for a period-style sink and shower head to complete the look. Now, the hallway may not be the first place you think about decorating, but it certainly shouldn’t be overlooked. The hallway is the first room you step into once you get home from a long day out. It also gives your guests the first taste of what’s to come style-wise throughout your house. Therefore, your hallway should function to bring you joy and give you — and your guests — a warm welcome. 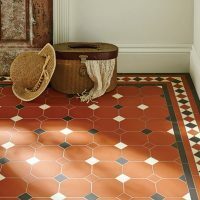 Victorian-style tiles are the perfect addition to any hallway. You’ll often see this look throughout a tradtional London hotel. They can instantly imbue an otherwise plain and small area with an abundance of style and charm. Even better? Tiles are also very durable and resistant. They can put up with muddy boots and paw prints, as well as damp coats and umbrellas — and remain super easy to clean (which makes your life a lot easier, too). 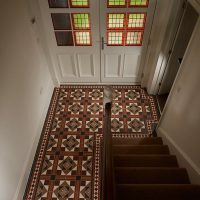 Your main decision when it comes to tiling your hallway will probably be: patterned or plain? It’s really up to your individual tastes, but since the hallway is such a small area (and not a proper room, per say) you can get away with using louder patterns than you would in other rooms. The attractive, intricate, and detailed patterns you have to choose from are endless! Victorian-style tiles will add interest and personality to your hallway; you’ll find it becomes one of your favourite “rooms” in your home! And what about colour? Red and terracotta hues are popular choice for hallways as they add much-desired warmth and cosiness. If you prefer to retain a lighter, fresher feel, however, you can opt for white, light blue, or other pale shades. What looks good with Victorian tiles in the hallway? When it comes to the walls in your hallway, opt for a neutral, plain shade to offset the bold pattern of the tiles. You don’t want to overwhelm the space with dark colours and bold patterns. Since hallways are often small and narrow areas, they can’t always fit many items of furniture — you’ll find the tiles become the central feature of your hallway. However, if you have the room, a simple entry table and mirror is all you need to open the space up and complete the look. They say the kitchen is the heart of your home — it’s where you cook and eat with your family and socialise with your friends. Why splash out on the bathrooms and not pay the kitchen some attention? It’s important you create the right vibe in your kitchen — and Victorian style tiles can help you do just that. 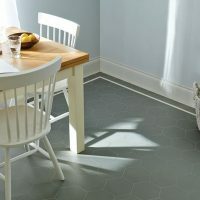 Whether you want something rustic, classic, or minimalist, the right kitchen tile can effortlessly set the tone, style, and atmosphere of your kitchen. If you’re unsure of going for a bold pattern in such an important room, make sure to check how the tile looks at different times of the day. This will give you an accurate idea of just how light and dark your tiles will look around-the-clock. You can also use tiles for the splashback in your kitchen. A simple white splashback will function to keep your kitchen easy to clean, as well as keep the room fresh and bright. What looks good with Victorian-style tiles in the kitchen? It depends! If you’re going for a traditional, rustic, or cottage look in your kitchen, you want to make sure it looks natural, busy, and lived-in. Things like pastel colours, wooden tables and chairs, vintage china, and hanging pots and pans work well here. Using Victorian-style tiles in sleek, modern kitchens will give the area a more spacious feel; the room should therefore be kept simple and not cluttered up with too many items. A conservatory is a great asset to any home and traditionally where you go to relax and enjoy the sun. The right Victorian-style tiles can work to uplift the room, increase space, and add light — making your conservatory a wonderful place to sit or entertain guests. Since there’s no shortage of natural light, you don’t have to be worried about choosing dark colours and bold patterns. In fact, the light will just show your floor off ever better! Of course, conservatories see their fare share of mud and water brought in from the outdoors. Tiles also have the added bonus of being really easy to clean. 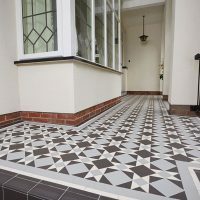 What looks good with Victorian-style tiles in a conservatory? A traditionally-themed conservatory works beautifully with traditional Victorian-style tiles — especially if you have a lush green garden to look out on. Botanical prints and plenty of fresh flowers and greenery will complement your floor nicely. You can even add rugs in the colder months to add even more texture and warmth to the space. Although you may be tempted to display some of your antiques alongside your Victorian-style tiles, it’s unfortunately not recommended to keep them in near-constant sunlight. Whether you’ve moved into a new house or are refurbishing an older building, there’s bound to be a Victorian-style tile to suit your home. Feeling daunted? That’s understandable. Choosing the right tile is a big decision and commitment — they do last a lifetime, after all! Explore our online shop for all your options and definitely don’t rush. You’ll soon find a beautiful Victorian-style tile to help create a home you love for years to come. In need of ideas? It’s always worth browsing pinterest or instagram for some excellent pointers. 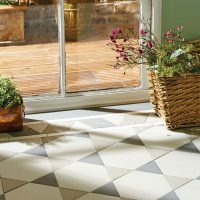 In addition to our vintage range, we also stock some great porcelain, ceramic and mosaic tiling options for the rooms where you want to avoid the period features. Get in touch with us to discuss prices, current deals and any other information you need.